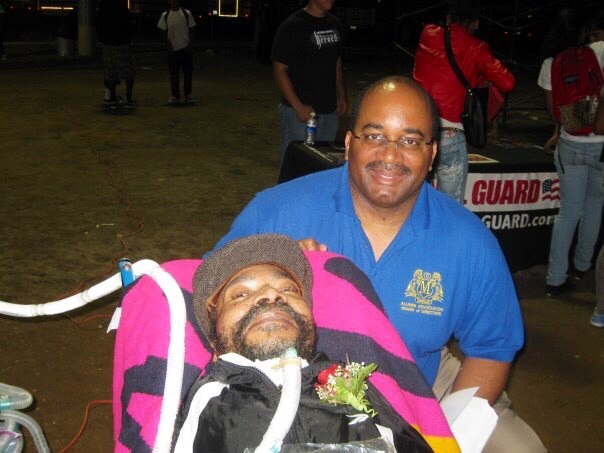 Victor Wright, who for decades inspired millions through his perseverance and faith after suffering a high-school football injury that left him quadriplegic, has died. Wright, who turned 55 April 8, died Saturday April 30, 2016 at his Altadena, CA home under the care of his family. Victor Johnell Wright was born April 8, 1961, in Knoxville, Tennessee, the fifth of nine children, to Donald and Dorothy Wright. Donald moved his family to Los Angeles when Victor was 4. The family first settled in a hotel room on L.A's south side, then moved into an Eastside duplex. In the late '60s they moved to Pasadena, where Victor's older siblings competed in sports at the local Boys Club. Soon his family was attracted to Altadena - which reminded them of their rural Tennessee lifestyle - where they bought their current home of nearly 50 years. Victor attended Madison Elementary and Edison Elementary. 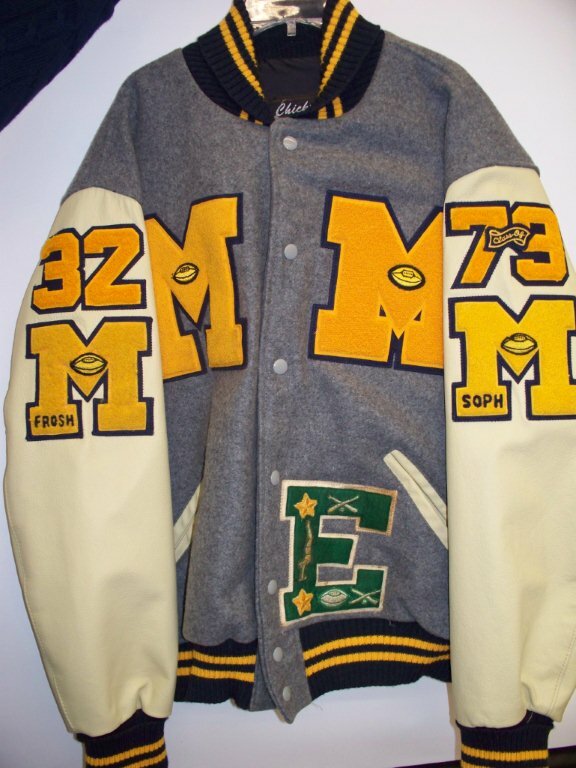 He was a promising athlete who lettered in five sports at Eliot Jr. High School. 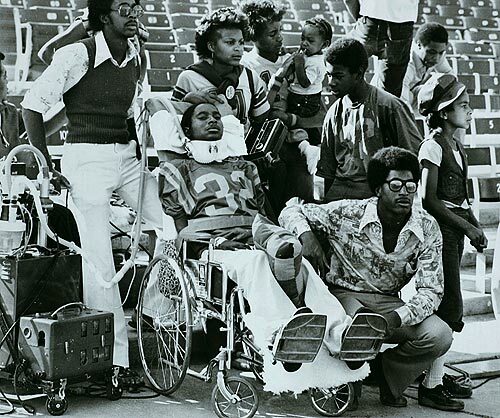 His dreams of being a running back at USC were shattered when he broke his neck as a sophomore while playing injured for John Muir High School in Pasadena, on a botched play during the second game of the 1976 season against La Cañada's St. Francis High. He spent six months in the intensive care unit at Huntington Memorial Hospital in Pasadena. Two months later, teammates who visited him credit him as being the inspiration for Muir's 13-10 win over arch-rival Pasadena High in the 1976 Turkey Tussle, which broke a 10-year losing streak in the annual rivalry (which has been dominated by Muir ever since). Wright was transferred to Rancho Los Amigos National Rehabilitation Center in Downey in early 1977, where he spent another six months before returning home. There he was home schooled by his high school English teacher Sylvia Jones and graduated on schedule with his classmates in 1979. In his book, he noted his dream was to play football at the Rose Bowl but receiving his high school diploma on the field was even more gratifying. His academic achievement motivated him to pursue a college degree. It took him 10 years but he became one of the first quadriplegics to accomplish that goal, an associate degree in human resources, through a rare program at Los Angeles City College for people with disabilities. His 1990 graduation was covered by longtime KNBC newsman Furnell Chatman, whose report caught the attention of John Dhanaraj, then a recent graduate of Fuller theological seminary. The two became instant friends because of their deeply religious faiths. Together, they co-founded Family of Friends International, a non-profit Christian charity dedicated to providing relief supplies and educational services to children abroad who have lost their parents to natural disasters. Their efforts included assistance to victims of the 2005 Tsunami along the coast of the Indian Ocean and the 2010 earthquake in Haiti. The organization provides bottled water, blankets, pencils, books and other supplies. Wright's achievements have earned him numerous accolades, including a 2001 benefit golf tournament, which raised thousand of dollars for much-needed medical supplies; Victor Wright Night, a 2007 ceremony at his high school auditorium honoring him, his mother Dorothy (who died last July) and family members who provided around-the-clock care; induction to the John Muir High School Alumni Hall of Fame in 2007; a 2009 halftime ceremony on the field where he suffered the injury where he received an honorary letter from former Muir varsity football coach Ken Howard; a letterman's jacket from his Muir classmates, paid for with proceeds from their 30-year reunion in 2009; and a leaf on the Lions Clubs International Tree of Life, found on the wall of the lobby of Rancho Los Amigos. In 2011, Wright became an ordained minister through the Association of Fundamental Ministers and Churches. In 2014 he became a published author when the book The Wright Stuff: A Story of Perseverance, Inspiration and Hope was released by AuthorHouse. It is available in soft cover, e-book and audiobook formats at AuthorHouse.com, Amazon.com and BarnesandNoble.com. 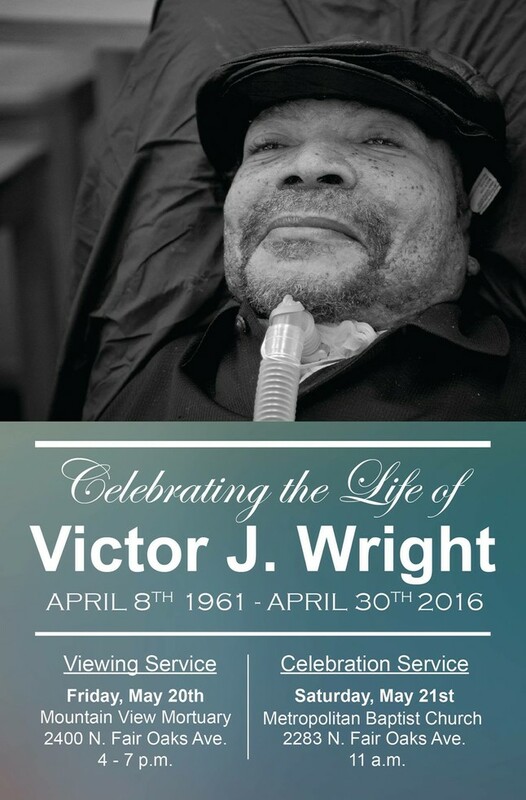 Victor Wright was a community treasure. What he and his family endured over the past 40 years was remarkable and inspirational and they handled it with dignity and grace. He is survived by his father Donald and siblings, Milton, Dexter, Deborah, Cheryl, Rebecca and Joseph. He never married. A memorial service is scheduled for 11 a.m. Saturday, May 20, at Metropolitan Baptist Church, 2283 Fair Oaks Ave., Altadena, CA 91001. A public viewing will be held Friday, May 20 at Mountain View Mortuary, 2400 Fair Oaks Ave.
For those of you wondering about our classmate Victor Wright, a lot of great things have happened in his remarkable life in recent years: most of you know that he graduated from Muir on time with his classmates in 1979, two and a half years after his devastating football injury, which left him paralyzed from the neck down. Since that time, he became one of the first quadriplegics to earn a college degree; in 2004, he co-founded a non-profit charity (familyoffriendsinternational.org), which offers relief services and supplies to children abroad who lost their parents in natural disasters; for these achievements, he was inducted to the John Muir High School Alumni Hall of Fame in 2008; in 2009, he received an honorary varsity letter at a halftime ceremony on the same field where his accident occurred; in 2013, Victor became an ordained minister; and now he is an author, having co-written his autobiography, "The Wright Stuff: A Story of Perseverance, Inspiration and Hope," with classmate David Rutherford. The book is currently in publication by AuthorHouse and is scheduled for release in paperback, e-book and audio forms in late 2014. Stay tuned to this link for the latest. 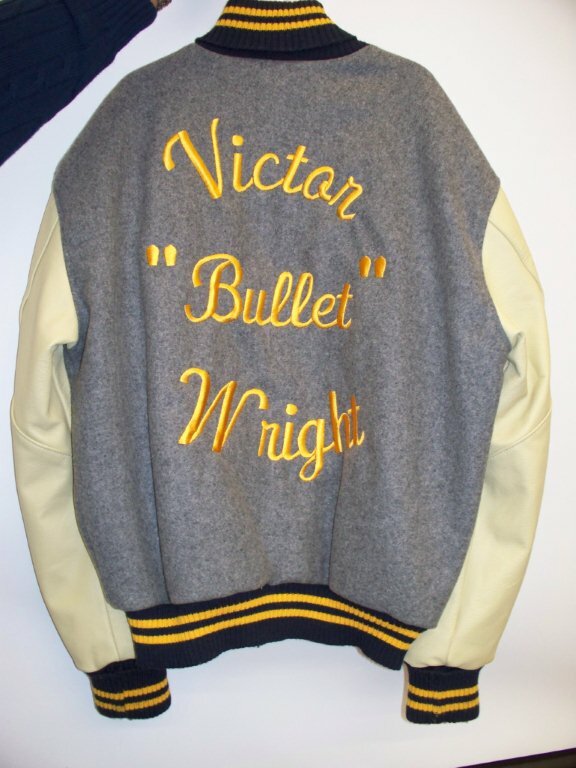 On March 6, 2010, Victor Wright finally received his Letterman's Jacket.